In October 2015 a photo of Emma Phillips (nee Taberer), held by Evan and Emma Phillips' grandchildren, was provided. This shows Emma in middle age. 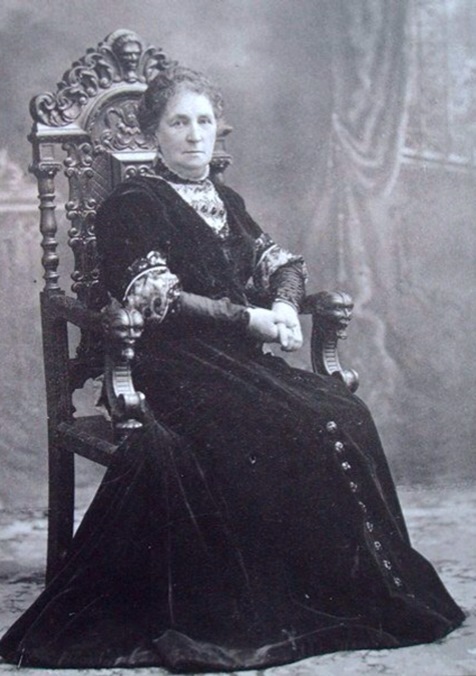 The photo was taken in a studio and shows her seated in a magnificent carved chair with Egyptian motifs (see below). Her dress appears to be velvet and must have used many yards of material. Can anyone help date this photo? If so please get in touch. Evan Phillips was a school teacher who was born in Wales and served on the Brentford Urban District Council. His name is on the Brentford Market extension (1905), now at Western International Market, the Monument (1909) where he is shown as a Justice of the Peace and the Chairman of the Brentford Council on Local Authority houses built in 1920 along Ealing Road. He was born in Brecon in 1857 and there are a number of possible entries in the 1861 census. The most likely entry is for him as a 4 year old living with his aunt and uncle who was a mason in Merthyr Tydfil. In 1871 he was a pupil teacher aged 14 living with his parents in Cardiff. His father, Robert (40) was also a mason. His mother was Sarah (38) and he had a younger brother, Robert (10) and 3 younger sisters. The birth of his brother may have been the reason that 10 years earlier he was living with his aunt and uncle. Evan Phillips married Emma Taberer in the Newport registration district Wales in 1876 and by the time of the 1881 census he was a Certified Teacher aged 24, with Emma aged 36 who had been born in Nuneaton. Emma was also a certified teacher and they had sons Charles and Vincent aged 3 and 1 born in Helindon, Northants. They had a domestic servant and a nursemaid aged 12. They were living in The Butts next door to Rutland House which at the time was a school for ladies run by Miss Celia Sims. It closed about 1882. It’s possible that they were teachers there but by the 1891 census they are Head Schoolmaster and Head Schoolmistress and living in Windmill Road. Evan seems to have aged suddenly and is shown as 45 with Emma 46. They have 4 sons Charles JT (13) born in Cardiff, Robert (12) and Vincent (11) both born in Helindon, Northants and Kenneth JT (3) born in Brentford. Their domestic servant was 15 year old Eliza Goddard. Their son Robert seems to be missing from the 1881 census. Living next door in 1891 was Stephen A Walker who was a Timber Merchant traveller. He was the son of Stephen Walker who had been a local councillor and had died in office a few months before the census. A school certificate of 1894 from the Brentford British School is signed by Emma Phillips, John Meyers and Leopold de Rothschild shows that they were the Head Master and Mistress at that school and provides a little more detail about the couple and their work. John Meyers had been the executor of Stephen Walker and was himself a local councillor. By 1901 they were living at 121, Windmill Road on the corner of Avenue Road. Their ages have been juggled again - Evan being shown as 44 and Emma 46. They are both still Head School master and mistress. Vincent was 21 and an ‘articled to Clerk C C’. Kenneth was 13 and they had a domestic servant called Edith Brooks aged 17. There are reports in the Middlesex Independent newspaper of events at the British (later the Rothschild) School. They seem to have had many concerts, sports and swimming competitions which are fully reported and name participants in the concerts and the prize winners in competitions. In March 1906 the annual prize giving ceremony was held in the Vestry Hall and a speech by Rev Nixon from St Paul’s Church tells that when he visited the school he was struck by the discipline and ‘the bright happy faces of the children which showed they were not ruled by harshness but by kindness and consideration.’ He then spoke in high terms of the work of Mr and Mrs Evan Phillips and pointed out that the school had turned out many excellent scholars, who were then occupying positions of importance. ‘A Memorable Meeting’ was the headline in October 1921 when there was ‘a large and representative gathering of townspeople’ at the school to commemorate Mr Phillips 40 years as Headmaster after his retirement on reaching retirement age and also his valuable service to the town. It was pointed out that the school was regarded as a model for the county by the Middlesex County Council and also by the Board of Education and after a number of speeches (including Mr Phillips who first thanked the parents for their support) he was presented with a monogrammed wallet containing a cheque for 100 guineas. Mrs Phillips would appear to have been Headmistress for 30 years and retired earlier. Evan Phillips’ name appears in the local directory at Grosvenor House, 17, Somerset Road in 1924 but not in 1928 although I haven’t found a death recorded in the area. It may be that they moved back to south Wales where Evan Phillips seems to be a very common name. (In October 2015 a descendant added 'Evan is buried in the cemetery of Landaff cathedral. He died 2 Jan, 1928, aged 71 years. His name on the gravestone appears midway in a list , starting with Louis Gwen, his youngest sister ,who seems to have died at 13 years of age, his father Robert, his mother Sarah and then finally in Feb 1941, another sister, Elizabeth. Janet has also provided a photo from 1900, an example of his signature and newspaper articles from 1914 (profile of his public life), 1921 (presentation celebrating 40 years as headmaster at the Rothschild School) and when he retired from his teaching career. To be added as time permits.